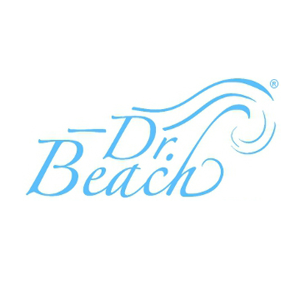 In 2011, Siesta Beach was rated as the #1 beach in the United States by “Dr. Beach”, a.k.a. Dr. Stephen P. Leatherman, director of Florida International University’s highly respected Laboratory for Coastal Research. In 2004 the Travel Channel named it “The Best Sand Beach in America” because of its 99% pure quartz sand that stays cool under your feet. 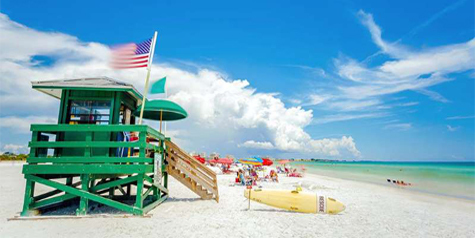 Siesta Key beach offers tennis and volleyball courts, shaded playground and picnic area, and convenient concession stands for a quick bite or a refreshing drink. Its shallow water near the shoreline and year-round lifeguard protection make it a great beach for the whole family. You can even borrow beach wheelchairs if you have visitor that needs help across the sand. 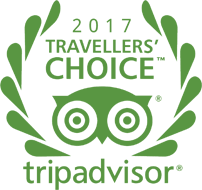 Whether you enjoy playing tennis or volleyball, fishing or boating, or a Drum Circle on Sunday evening to mark the end of another perfect weekend on Siesta Key, there’s always something to do on Siesta Beach and it is all within walking distance of the many shops and restaurants on Siesta Key Village. Parking: While the new renovation has expanded the parking lot to approx. 950 spaces, it is recommended that you get to the beach early to secure one of these spots. For those arriving later, St. Boniface Episcopal Church (5615 Midnight Pass Rd, Sarasota, FL 34242) offers paid parking a relatively short walk from the beach. Beach goers choosing this option might want to drop their coolers and supplies off at the main public lot before parking offsite. Located on the southern tip of Siesta Key, Turtle Beach offers a “sportier” beach experience with its picnic areas, playground, volleyball court, and horseshoe pit. Turtle Beach has a boat launch area and fishing is permitted in the adjacent Blind Pass Lagoon. This area has restaurants, shopping and a few local night spots nearby. Turtle Beach is a narrow beach with a steeper incline and darker sand that carries more shells. This beach is perfect for beach combers and shell collectors; you might even find a petrified shark’s tooth to take home, especially after a storm. Parking: While there are only approx. 200 parking spots at Turtle, it is usually easier to get a spot here than at Siesta Public Beach. This Siesta Key Beach Access #1 is nestled between residential beachfront homes, is great for fishing, sunbathing. With approx. 9 parking spaces. Overlooking Big Sarasota Pass, Great views, relax and watch boats entering and exiting the Gulf of Mexico. No Swimming No lifeguard. This Siesta Key Beach Access #2 is an Old Broken Fishing Pier, foot traffic only, permit parking only on street, great for beach fishing, sun bathing, picture taking. This Siesta Key Beach Access is convenient to area Siesta Village accommodations and resorts. No Swimming, No lifeguard. Siesta Key Beach Access #3 located within walking distance from Siesta Village resorts and accommodations. Swimming, sunbathing, fishing, foot traffic only, no parking, No lifeguard. Siesta Key Beach Access #4 is on the north end of Siesta Key. This area is visited by vacation guests and locals for swimming, sun bathing, Gulf of Mexico Sunsets, shoreline fishing, Walking distance from Village rentals, shops, restaurants and vacation accommodations. No Lifeguard. 4 parking spots. Siesta Key Beach Access#8 is located on Beach Road and is easily accessible for Siesta Village Accommodations and rentals. The foot path leads right to the white sandy beaches of Siesta Key. There is Swimming, and sunbathing. Many family beach sunset pictures have been taken along this beach. Approximately 20 parking spaces. No lifeguard. Siesta Key Beach Access #9 is centrally located on Beach Road, close to Siesta Village and accommodations in the area. Foot path to the white sandy beaches of Siesta Key, swimming, sunbathing, bike rack, approximate 20 parking spaces, No lifeguard. Siesta Key Beach Access #12 is across from Captain Curt’s Restaurant. Just over the south bridge turn right at light on Midnight Pass Road and Beach Access 12 is on your right. This beach access is convenient to Crescent Beach Resorts and South Bridge Restaurants. Beach area is great for swimming, sun bathing. There are approximate. 25 parking spaces, No lifeguard. 1001 Point of Rocks Blvd. Located just south of Siesta Beach and with only one public access road, you can enjoy the same azure gulf waters and picture-perfect sunsets in a quieter, more secluded setting. At the southern tip of Crescent Beach, you’ll find Point of Rocks, an area rich with coral formations and colorful marine life that is perfect for snorkeling or diving. Crescent Beach is the most private, non-private beach in town. The sand at Crescent Beach was rated as “The World’s Finest, Whitest Sand™” at the Great International Sand Challenge in 1987 beating more than 30 entrants.